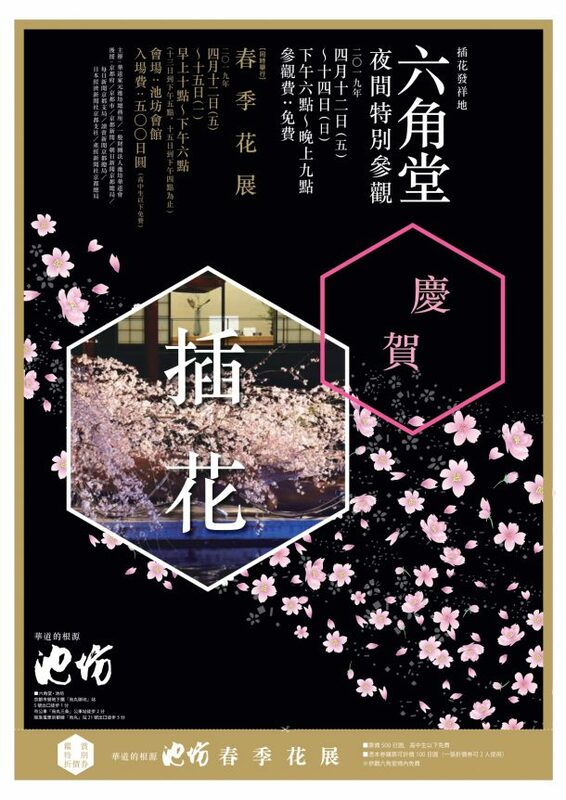 Congratulatory works for the 30th Anniversary of His Majesty the Emperor’s Accession to the Throne, new Imperial era name, Tokyo Olympics and many more arrangements will be exhibited in the precincts of the Rokkakudo Temple under the theme of “congratulate”. Rokkakudo Temple will be beautifully illuminated by lanterns in the evening.Temple illumination is only for this three days period of the year. 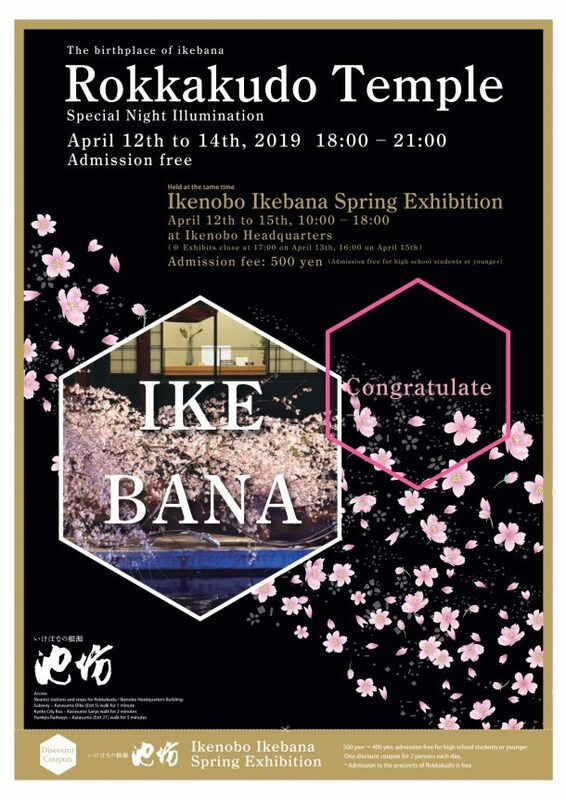 This will be the last Ikenobo Ikebana Spring Exhibition of the Heisei Period. 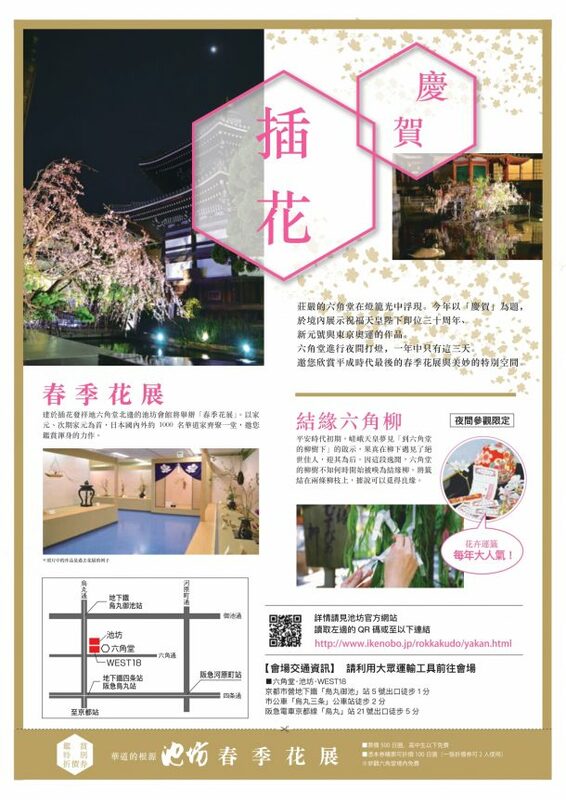 Don’t miss this opportunity to experience authentic Japanese traditional culture. 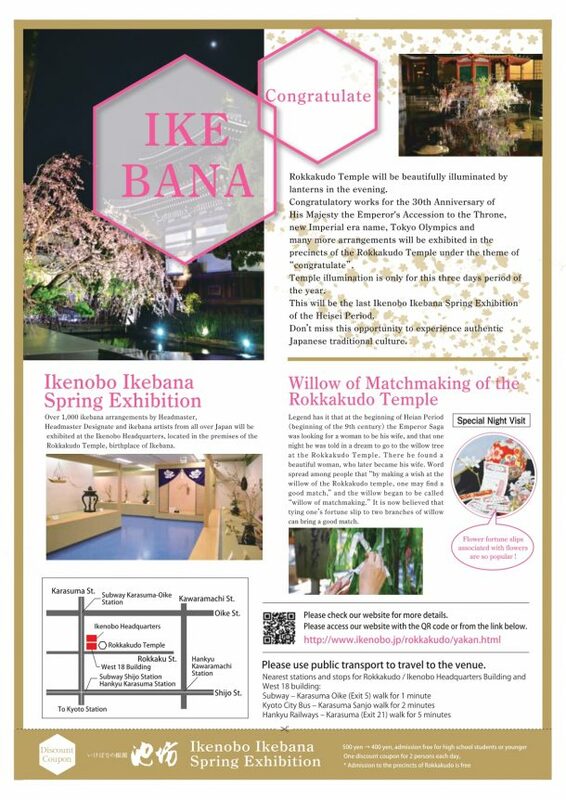 Over 1,000 ikebana arrangements by Headmaster, Headmaster Designate and ikebana artists from all over Japan will be exhibited at the Ikenobo Headquarters, located in the premises of the Rokkakudo Temple, birthplace of Ikebana. Legend has it that at the beginning of Heian Period (beginning of the 9th century) the Emperor Saga was looking for a woman to be his wife, and that one night he was told in a dream to go to the willow tree at the Rokkakudo Temple. There he found a beautiful woman, who later became his wife. Word spread among people that “by making a wish at the willow of the Rokkakudo temple, one may find a good match,” and the willow began to be called “willow of matchmaking.” It is now believed that tying one’s fortune slip to two branches of willow can bring a good match. ※Please use public transport to travel to the venue.